Immunogen: Synthetic peptide corresponding to the middle of human Grp75 (mortalin). Application Notes: Detects a band of ~75kDa by Western blot. Scientific Background: Cells from various organisms increase expression of a class of proteins referred to as heat shock or stress proteins in response to adverse changes in their environment. The members of one class of stress proteins, the Hsp70 family, all bind ATP in vitro, but exist within different intracellular compartments. Members include constitutive form Hsc70 within the cytosol/nucleus; inducible form Hsp70 within the cytosol/nucleus/nucleolus; the constitutive glucose-regulated 78 kDa (or BiP) protein within the lumen of the endoplasmic reticulum; and the constitutive glucose-regulated 75 kDa protein within the mitochondrial matrix. Members of the Hsp70 family appear to function as molecular chaperones, assisting in the folding of other proteins in various intracellular compartments. Grp75 resides in the mitochondrial matrix where it collaborates with Hsp60 in the re-folding of proteins translocated into this organelle. Like itsE. coli homolog DnaK, Grp75 possesses a cation-dependent ATPase activity considered central to its function as a chaperone. 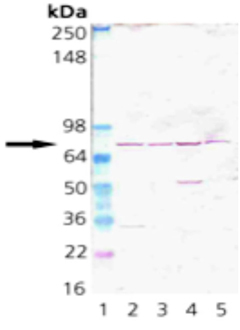 Western blot analysis of Grp75 (Mortalin): Lane 1: MW marker, Lane 2: HeLa cell lysate, heat shocked, Lane 3: RK-13 cell lysate, heat shocked, Lane 4: 3T3 cell lysate heat shocked, Lane 5: PC-12 cell lysate heat shocked.